Perinatal anxiety is very common. In a recent Australian study, one-fifth of women assessed during late pregnancy and reviewed at 2, 4 and 6–8 months after the birth had an anxiety disorder (approximately two-thirds with co-occurring depression) and almost 40% of women with a major depressive episode had a co-occurring anxiety disorder. 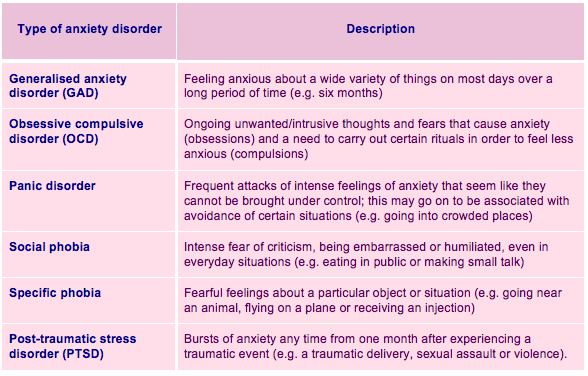 There are a number of different types of anxiety disorder. The most common conditions that arise in pregnancy or after birth are detailed below. Antenatal anxiety may occur in response to fears about aspects of the pregnancy (e.g. parenting role, miscarriage, congenital disorders), or as a continuation of a pre-pregnancy condition and/or comorbidly with depression. Higher levels of self-reported anxiety or anxiety disorder in pregnancy increase the risk of depression postnatally. Anxiety disorders can have significant effects on the health and wellbeing not only of the mother, but also her partner and other children. The latest research also reveals that anxiety disorders can have a negative impact on the growth and development of the foetus/baby, so early detection and intervention is paramount. In many instances anxiety symptoms are not recognised, as they are often viewed in the context of pregnancy or adjusting to the baby. In addition, high levels of stigma may prevent women seeking help.